Do you have a New Years resolution to lose weight or get back into shape? If you hurry now you can grab a multifunctional digital scale at 50% Off right here! This scale does sooo much more than a regular scale. It measures your weight, body fat, hydration, muscle and bone mass. It provides you with a calorie recommendation. Easy turn on with your foot, has a clear digital display and has user memory for up to 12 people! And there is FREE shipping! All you have to do is sign up easily with savmore.com (you need an active email address), savemore will give you a $10 credit for joining. 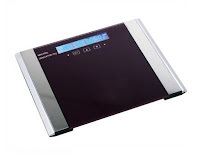 This scale is valued at $55... it's on sale through savemore for $26... and with your $10 credit and FREE shipping you will only pay $16. That is an awesome deal! I have received many product through Savemore including; teeth whitening strips, reusable water bottles and so much more!